With PINOCCHIO, VAMPIRE SLAYER, Dusty Higgins & Van Jensen have turned a clever premise into a critically acclaimed fan-favorite comic adventure. Now the entire 528-page saga can be yours — along with a dozen other unhallowed books & graphic novels — in the name-your-own-price Humble Horror Book Bundle! Launching today and continuing for two weeks, this DRM-free digital deal celebrates Halloween with work by Stephen King, George R.R. Martin, Neil Gaiman, Clive Barker, Joss Whedon, Joe Hill, Max Brooks, and many more spooky talents. After naming their own price, customers can download thousands of pages of horror entertainment, while simultaneously helping to prevent real-life horrors: a variable portion of each purchase can be allocated to both the anti-sexual-assault organization RAINN and the Comic Book Legal Defense Fund. 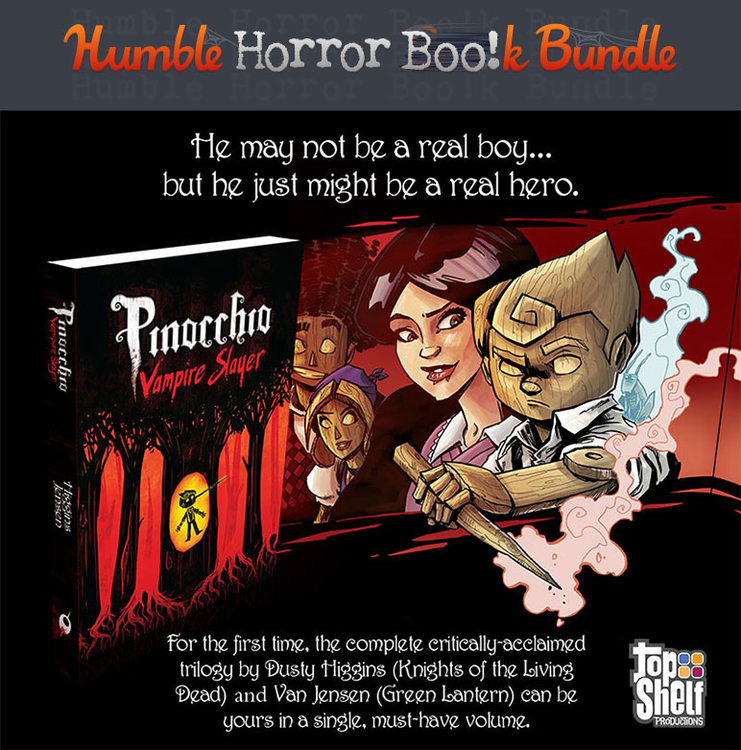 For more details and to download your Bundle today, visit www.humblebundle.com/books. 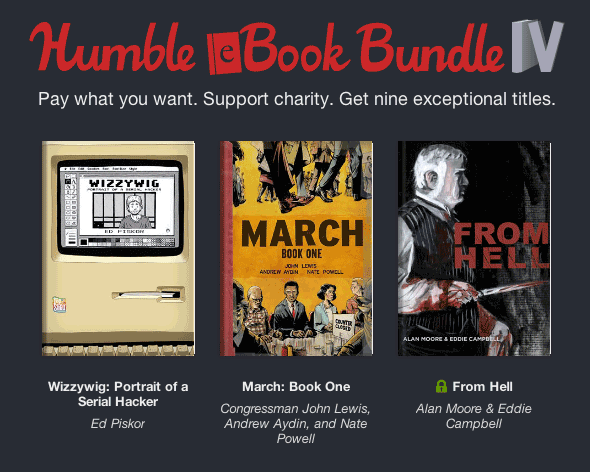 Download your Humble Bundle at www.humblebundle.com/books! 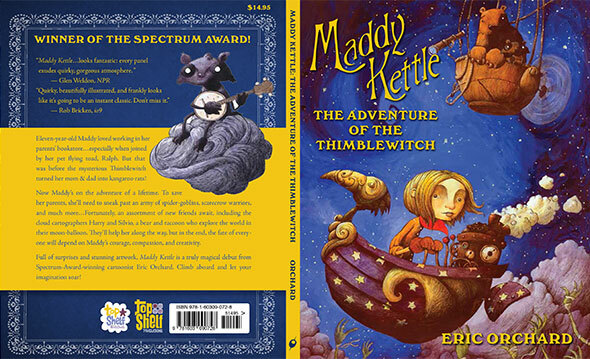 Eric Orchard is coming from Toronto for the debut American signing of his critically-acclaimed graphic novel for all ages, Maddy Kettle: The Adventure of the Thimblewitch. 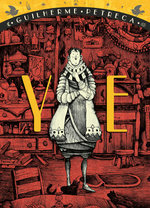 He's a tremendously talented illustrator and his book is truly gorgeous, full of whimsy, comedy, and quirky atmosphere. Mark Russell and Shannon Wheeler are flying out from Portland for the east-coast debut of their very popular GOD IS DISAPPOINTED IN YOU panel (a big hit at Emerald City and San Diego Comic-Cons), based on their witty and informative book of the same name (just released in a new printing), which will be Friday at 5:15pm, and they'll sign their book throughout the show. It's the perfect gift for the believer AND the heathen in your life. 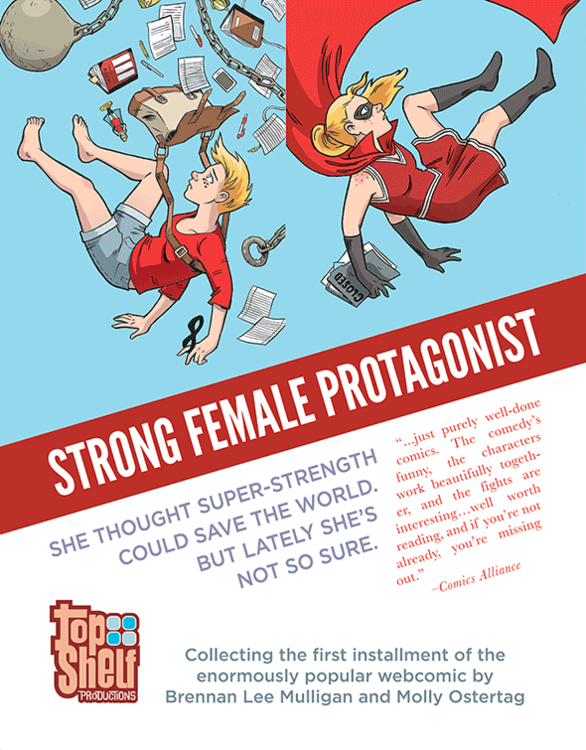 Brennan Lee Mulligan and Molly Ostertag are two young New Yorkers who have racked up a tremendous following for their webcomic Strong Female Protagonist, a smart and very modern take on the superhero genre through the eyes of a new generation. They had a phenomenally successful Kickstarter to bring it to print, and now Top Shelf is helping them distribute the book! 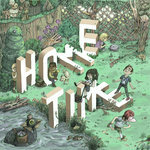 Molly and Brennan be with us at NYCC, signing debut copies. Come on by booth 2238 and say hello! 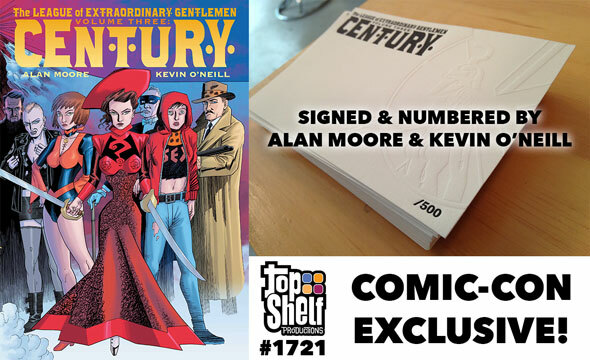 Famed artist Kevin O'Neill is coming all the way from London for his first US appearance in years, to debut the complete League of Extraordinary Gentlemen: Century hardcover, including a $50 limited edition, signed & numbered by both himself and writer Alan Moore (which is Top Shelf's first ever official Comic-Con exclusive)! 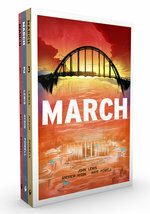 Earlier this week we revealed the cover to possibly our most-anticipated release ever, March: Book Two! 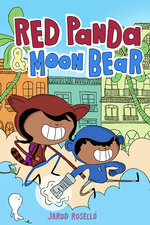 At Comic-Con we'll have Andrew Aydin and Nate Powell signing Book One and sharing more details about Book Two (an early 2015 release). We'll have the special advance debut of Eric Orchard's buzzed-about fantasy graphic novel Maddy Kettle: The Adventure of the Thimblewitch - plus free Maddy Kettle posters! Jeffrey Brown will join us to sign all his terrific Top Shelf books as well as the brand-new Goodnight Darth Vader (Chronicle) and Jedi Academy Book 2: Return of the Padawan (Scholastic)! God Is Disappointed in You, published by Top Shelf, is the tongue-in-cheek "condensed" version of the Bible you never knew you needed -- hilariously modern, but surprisingly authentic -- with illustrations and gags by New Yorker cartoonist Shannon Wheeler (Too Much Coffee Man). Join him and writer Mark Russell for an hour of unforgettable irreverence, including Q&A, audience sketches, and the hilarious-yet-accurate "ten-minute Bible." 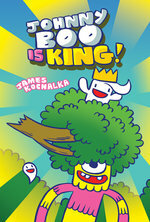 PLUS: a taste of the new audiobook, read by Dr. Venture himself, James Urbaniak (The Venture Bros.)! Top Shelf Productions featuring Kevin O'Neill and more! We're so excited to debut The League of Extraordinary Gentlemen: Century hardcover that we flew artist Kevin O'Neill all the way from England for his first US visit in years! You think in his 15 years of collaboration with Alan Moore on the League, he's picked up a good story or two? 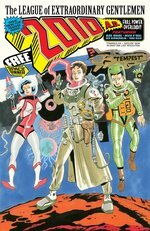 PLUS: Top Shelf continues to innovate with new digital projects, meet the genius minds behind our latest graphic novels, and get a look at the much-anticipated Book Two of March, the #1 New York Times bestselling graphic memoir trilogy by Congressman John Lewis, Andrew Aydin, and Nate Powell! 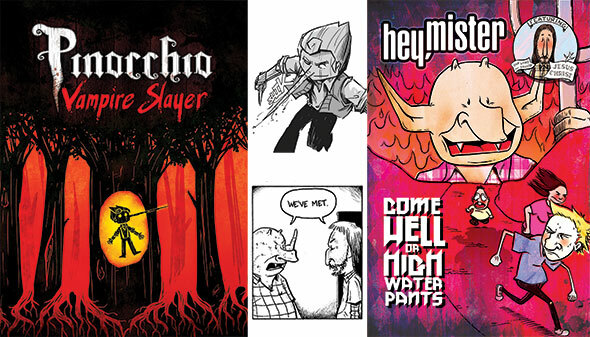 Meet the authors of two outstanding recent releases: Van Jensen will be signing the thrilling Pinocchio, Vampire Slayer (complete edition), while Pete Sickman-Garner signs the fiendishly entertaining Hey, Mister: Come Hell or Highwater Pants! Whew! You'll find all this -- and more -- at the Top Shelf booth (#1721). See you there! 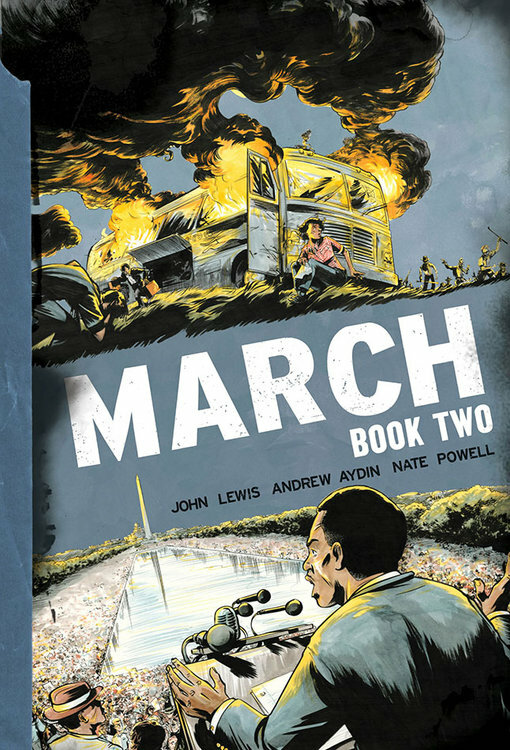 US Congressman and civil rights icon John Lewis made history with the release of March: Book One, his award-winning and #1 bestselling graphic novel memoir co-written with Andrew Aydin and drawn by Nate Powell. Aside from the unprecedented factor of such a major figure using the graphic novel format, the book has been embraced as both a true work of literature and also a much-needed tool for reaching new generations with the history and lessons of the civil rights movement. But John Lewis isn't finished making history. Today, for the first time, we're revealing the gorgeous cover design of March: Book Two, the much-anticipated second part of the March trilogy. It's scheduled for release in early 2015, so we're still half a year away — but the interest in this title is so tremendous that we wanted to showcase something special now, as we head into Comic-Con next week. Book Two will be significantly longer than Book One, taking a step forward into the tumultuous events of 1961-1963 while continuing the framing narrative of President Barack Obama's inauguration in 2009. Major plot lines include the famous journey of the Freedom Riders, imprisonment at Mississippi's Parchman Penitentiary, and young John Lewis' involvement in helping to plan and lead the legendary 1963 March on Washington. Nate Powell's powerful cover showcases (on top) the Freedom Riders' bus set on fire by a white supremacist mob in Anniston, AL, May 14, 1961, and (on bottom) Lewis' fiery speech at the March on Washington, August 28, 1963. 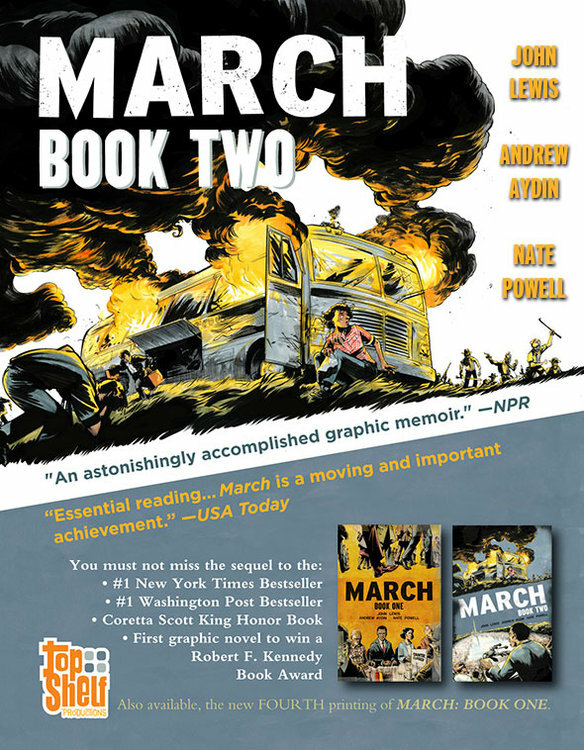 Watch Lewis and Aydin discuss March and showcase the Book Two cover on CNN! As before, we're offering two special editions of March: Book Two exclusively from Top Shelf, in addition to the regular softcover — there is a hardcover edition as well as a limited edition signed & numbered hardcover. Please join us in celebrating this first look at the next step in the record-breaking March project! Book One continues to rack up awards and honors, has been adopted by schools in 30 states, and is currently being read by 15,000 incoming freshmen at 3 major universities, so the journey of this project is truly just beginning. Sunday morning in Las Vegas was a great occasion for African-American books for young people, as the American Library Association's 45th annual Coretta Scott King Book Awards celebrated the very best in the field. 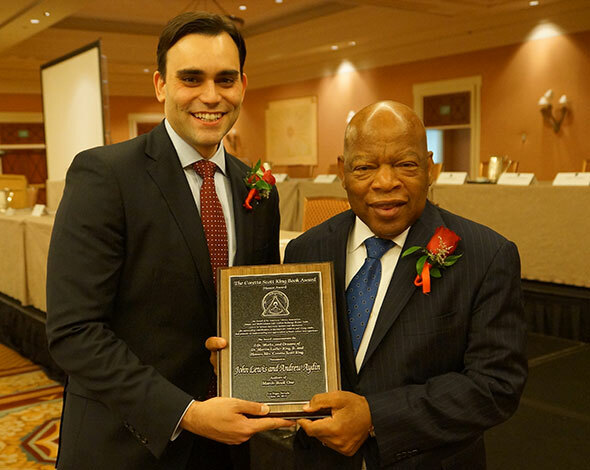 History was made as, for the first time ever, a sitting member of Congress was one of the honorees: Georgia representative and civil rights icon John Lewis and his co-author Andrew Aydin received the Author Honor for their graphic novel March: Book One, drawn by Nate Powell. Congressman Lewis spoke movingly at Sunday's ceremony about his memories of Mrs. King and his hopes for the March trilogy, while Aydin thanked his mother for teaching him the importance of libraries, and singled out Powell's artistry for recognition. March: Book One, named one of the year's best books by USA Today, The Washington Post, Publishers Weekly, and many more publications, recently received a Robert F. Kennedy Book Award and has been selected as required reading for first-year students at three major universities (totaling 15,000 freshmen). It has also been adopted by schools in 30 states at the elementary, middle, and high school levels, and spent over 30 weeks on the New York Times bestseller list, including several weeks at #1. It's been a while since beloved indie cartoonist Jeffrey Brown released his shape-changing robot parody Incredible Change-Bots and its hilarious sequel Incredible Change-Bots Two... In the meantime, he's gone and launched TWO best-selling Star Wars series for kids, Darth Vader and Jedi Academy! And now he's back, with the biggest Change-Bots book yet. Collecting over 200 pages of rare "odds, ends, and missing parts," Incredible Change-Bots Two Point Something Something includes short stories, gallery art show pieces, game and toy designs, artwork created for fan club members, interviews with almost every Change-Bot, and more. Click here for a ten-page preview, and pre-order now with your favorite retailer! 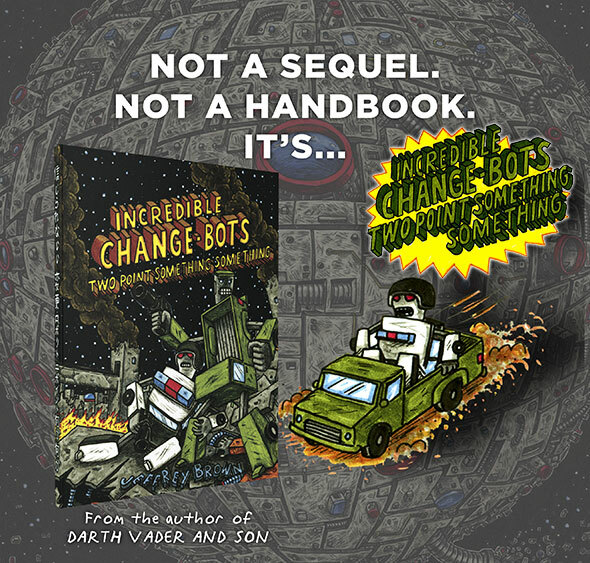 Note: a limited HARDCOVER edition of Change-Bots Two Point Something Something is also available, exclusively from Top Shelf! Click here for details. Also opening for pre-order is the gorgeous new softcover edition of Lars Martinson's Tonoharu Part One! This Xeric-award-winning book turned many heads in its original hardcover release, called "stunningly good" by Boing Boing. Now Lars brings his international opus to a more affordable softcover format. More details and an 8-page preview here! Our newest addition to the Top Shelf Kids Club, Eric Orchard's spooky and whimsical adventure Maddy Kettle, won't be out until September... but anticipation is already building! Not only has Eric sown the seeds with a 16-page preview in last month's Free Comic Book Day issue, but now we have more good news: Maddy is an official selection of the Junior Library Guild! The JLG services thousands of subscriber libraries, who have a standing order to receive its selections each month... so the competition is fierce to be the ONE title selected for each category in a given month. 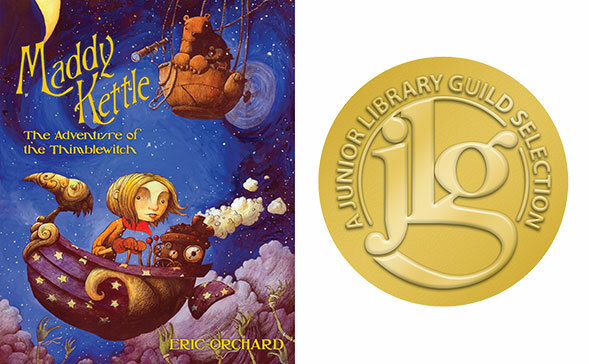 In the world of kids' books, landing the JLG is considered a good omen, often the first step in a run of additional honors! We can't wait for you all to fall in love with Eric Orchard, his creation Maddy, and their fantastical world. Reserve your copy today from your favorite retailer! The Top Shelf Kids Club is already home to so many beloved characters... but there's always room for more! As of now, pre-orders are officially open for two great books debuting in August 2014. Eric Orchard's Maddy Kettle was introduced to the world in this spring's Free Comic Book Day issue, and the response has been terrific. 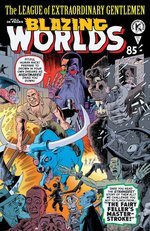 NPR said it "looks fantastic: every panel exudes quirky, gorgeous atmosphere,” while io9 agreed it was "quirky, beautifully illustrated, and frankly looks like it's going to be an instant classic. Don't miss it." What's more, an early version of a Maddy Kettle scene has already received the Silver prize at the Spectrum Awards, honoring the best in fantasy art. 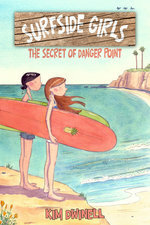 Now Maddy's full adventure is off to the printing press, and it's time to pre-order from your favorite retailer! And that's not all... we're also announcing the return of Johnny Boo, the best little ghost in the world — and he's brought company! 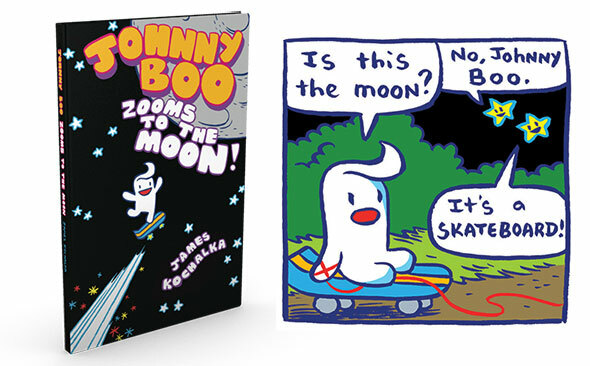 When author James Kochalka asked what adventure Johnny Boo should go on next, many readers wanted him to visit the moon. Others wanted him to ride a skateboard. Well, dreams do come true! 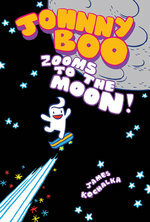 Johnny Boo Zooms to the Moon! has all this and more, including moon ice cream, a new monster, and the mighty Boom Power of new friend Susie Boom! Click through for details and a free preview of each book! The Humble eBook Bundle deal -- in which you can pay what you want and download a bundle of great digital books -- just got even sweeter. 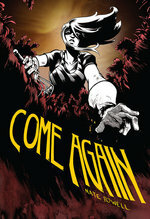 As of today, the bundle has swelled to thirteen titles, including the acclaimed The From Hell Companion by Alan Moore & Eddie Campbell (called "A man-behind-the-curtain look at a seminal graphic novel... an indispensable reference") and Alex Robinson's Too Cool to Be Forgotten (winner of the Harvey Award for best graphic novel!) as well as an audiobook by Cory Doctorow, and James K. Morrow's award-winning Shambling Towards Hiroshima. All this in addition to the terrific bargain it already was. So head on over and grab your bundle - there's only one week left! We at Top Shelf Productions are very pleased to partner with the team at Humble Bundle to offer several of the comic industry’s most acclaimed graphic novels, completely free of DRM restrictions, as part of “Humble eBook Bundle IV.” For the next two weeks, customers can name their own price for the bundle, which marks the first ever DRM-free release of Wizzywig by Ed Piskor and From Hell by Alan Moore & Eddie Campbell, plus March: Book One, the award-winning civil rights graphic memoir by Congressman John Lewis, Andrew Aydin, and Nate Powell. 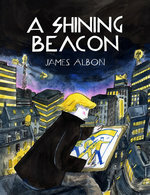 Every so often, a graphic novel comes out that is so remarkable and so important, it breaks out of traditional categories, forcing readers and institutions to reconsider their expectations of what the comics medium can do. In 1992, for example, Art Spiegelman's Maus depicted the life of a Holocaust survivor with such innovative power that the Pulitzer Prize committee issued Spiegelman a "Special Award." 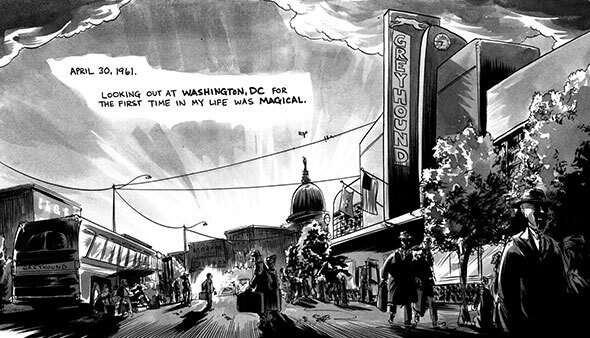 Now, the RFK Center for Justice and Human Rights has announced that March: Book One, the first volume of Congressman John Lewis' civil rights memoir co-written with Andrew Aydin and drawn by Nate Powell, will receive a "Special Recognition" award at the 2014 Robert F. Kennedy Book Awards, to be awarded in a ceremony tomorrow night, May 22, in Washington, D.C.
Fittingly for an icon of the civil rights movement, this will be Congressman Lewis' second honor from the RFK Book Awards; his prose autobiography Walking with the Wind won in 1999. The awards, founded in 1980, celebrate those books which best reflect the late Senator Kennedy's ideals of justice, human rights, and equality of opportunity. In his capacity as attorney general, senator, and presidential candidate, Kennedy played a significant role in the civil rights movement throughout the 60s, and indeed will appear in the forthcoming second and third volumes of March. 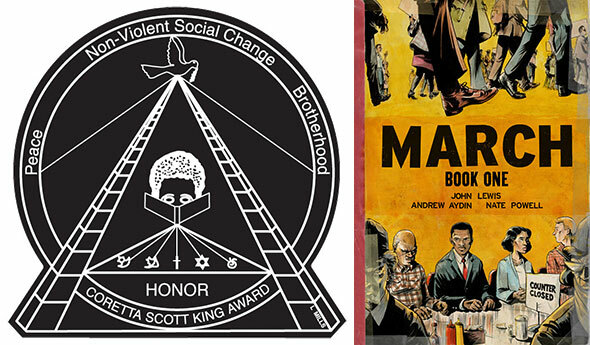 This honor also places the March team in fine company in another way: the RFK Book Awards' only previous use of the Special Recognition was also for comics, awarded in 1994 to the legendary editorial cartoonist Herblock.